A further eight demonstration trials have been planted over the 2018 spring. 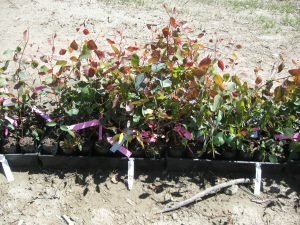 These trials contain a range of durable eucalypt species of interest: the new sites extend the range of regions where NZDFI species are being evaluated. Once established, Permanent Sample Plots will be installed in the trials so that we can monitor performance. The new sites are located in Marlborough, Northland (2), Hawkes Bay, Waikato, Bay of Plenty, Manawatu and Taranaki. Species planted are: E. bosistoana, E. cladocalyx, E. globoidea, E. macrorhnycha, E quadrangulata and E. tricarpa. Some seedlings were grown from seed collected from NZDFI seed stands; others from Australian seed. All the seedlings were grown by Morgans Road Nursery, Blenheim. 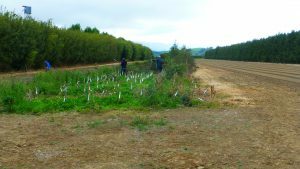 The NZ Redwood Company trial site, Papamoa. 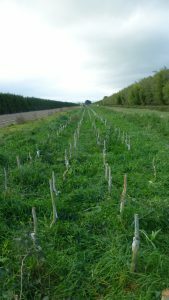 In November 2018 a significant milestone was reached in the NZDFI breeding programme for E.bosistoana, when a clonal test using cuttings was planted at two Marlborough locations. The cuttings were propagated by Proseed NZ in their new facility in Amberley. 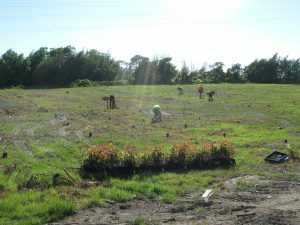 The cuttings originated from the coppice regrowth of two year old trees planted in a nursery based trial at Woodville in 2015 (see 5. below). These trees were evaluated for strain, stiffness, twist, density, shrinkage, acoustic velocity and growth. A selection index from the breeding values of these traits was used to identify the individuals in the Woodville trial for propagation. These families were also planted in progeny trials between 2009 and 2012 and additional growth and form data is available from some of those earlier plantings. Propagation success was variable with the number of cuttings produced per clone ranging from 0 – 88. This is the first time that clones from pedigreed material have been produced in a quantity that could be established in clonal trials. 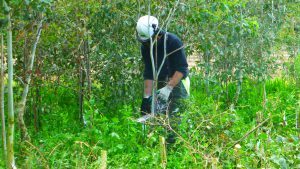 A large trial has been established in stony silt site on Wairau River reserve land owned by Marlborough District Council. a thick cover of woody weeds and vines were removed and the site oversown with grass/clover mix prior to planting. 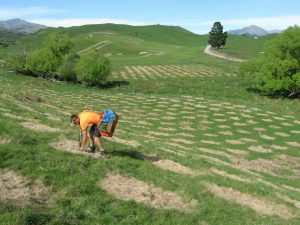 A smaller step-out trial was planted on ex pasture at the Dillon’s property up the Waihopai Valley. The trial design is a modified version of an optimised design, a design which has been used for clonal testing by the Radiata Pine Breeding Company since 2013. It is an efficient use of small numbers of plants specifically when using ramets per clone. Table 1. E.bosistoana clonal trials planted in 2018. Recent inspections of the trials show that the cuttings are well established with survival greater than 95% and height has doubled since planting in early November. Further propagation is planned for a subset of these clones from the stool plants being maintained by Proseed. Information gathered during the propagation process and additional analysis of measurement data from the progeny trials will assist with the selection of these clones. Planting our first ever clonal trial, Marlborough. 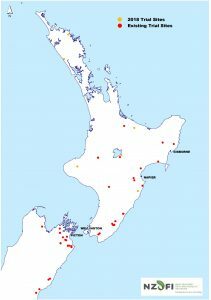 Where should new NZDFI Permanent Sample Plots (PSPs) be located? 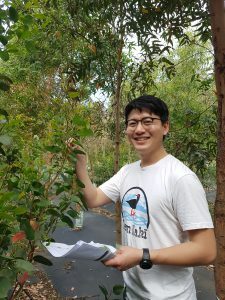 Masters student Thai son Le recently completed research into which areas NZDFI should target for new permanent sample plots (PSPs) of E. bosistoana and E. globoidea. Thai son Le developed a priority index and produced maps of the best places to locate PSPs in future. 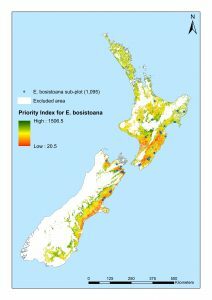 Optimal locations for new E.bosistoana PSPs. 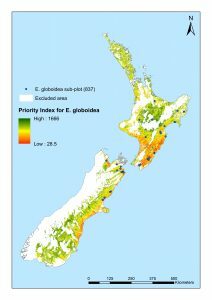 Optimal locations for E.globoidea PSPs. Thai son Le’s research came after the sites for our eight new demonstration trials were selected. These new trials will contain PSPs, and, it is interesting to see how closely the locations of some of the trials match the areas identified as high priority by Thai son Le. Work at University of Canterbury EPECentre to dvelop a tool to measure sapwood depth in standing trees is well advanced. 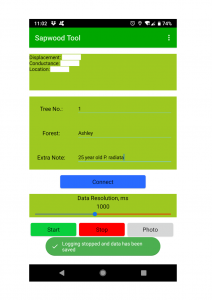 This tool will be used to identify trees with early superior heartwood development. It works by recognising that sapwood and heartwood have different electrical conductivity. 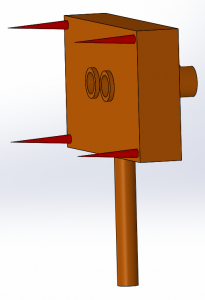 The new tool requires two parallel holes to be drilled radially into the timber, vertically aligned. The holes are drilled using a knock-on/pull-off stencil which can be deployed very rapidly (Figure 1). 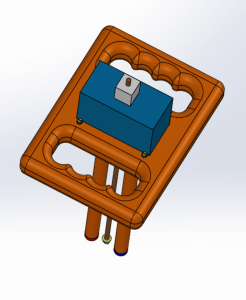 The measurement tool consists of two insulated (except for the tip) electrodes and a penetration depth sensor mounted in-between. The tool can be very quickly pushed into the holes and then immediately be extracted again (Figure 2). The tool will eventually be battery powered and will communicate conductance and depth data in real time to a mobile phone App (using Wi-Fi) (Figure 3) which will process the data and determine the sapwood-heartwood boundary using an algorithm as well as store all the data. Fig 1. The drill stencil. Fig 2. The sapwood depth tool. Further information about the tool’s development is available in a conference presentation given by the authors in June 2018. 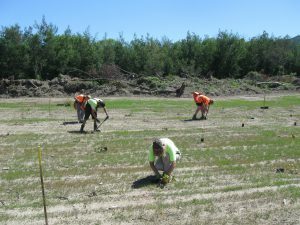 The final harvest of trees planted in a trial at Murrays Nursery, Woodville, in 2016, was undertaken in December 2018. The trial comprised multiple families of a range of Class 1 durable species: E. bosistoana, E. argophloia , E. tricarpa, and E. sideroxylon. 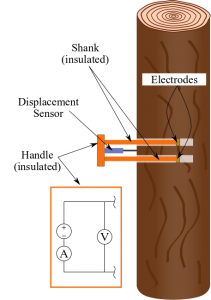 The research aimed to investigate growth strain and other wood properties including shrinkage, density and Modulus of Elasticity in very young trees. The primary aim is to ascertain whether superior genotypes can be identified and early selections made. The cut stems were transported to the School of Forestry’s Wood Technology Centre, where testing and data analysis is underway. A final report is due to be produced midway through 2019. The trial site after harvest. 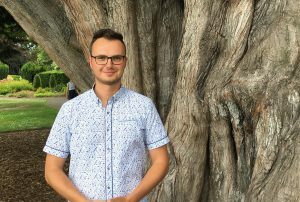 A number of new post-graduate students have joined the NZDFI team at the University of Canterbury School of Forestry over the past few months. They are a multi-national group, and we are very fortunate to have attracted such high-calibre individuals from across the globe. If our experience of past international post-graduates is anything to go by, we can expect some great contributions from these students. Here we introduce four of our new team. My name is Daniel Boczniewicz and I come from Poland – the home country of the world's largest population of European bison (Bison bonasus). In my family being a forester is the tradition and the honour. Since my great-grandfather Seweryn, who worked as a forester in 1920s, through my grandfather Piotr and father Bogdan, I am the 4th generation of foresters. In 2015 I finished my Forestry Bachelor and Masters Degree at Poznan University of Life Science in Poland, which provided me with a great education. After that I had the opportunity to work in an international forestry environment in Sweden where in 2017 I graduated the Euroforester Master program with Biology Degree at the Swedish University of Agricultural Science in Alnarp. 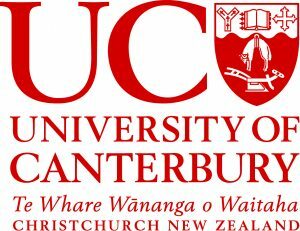 I am really lucky to continue my forestry adventure as a PhD student of School of Forestry at Canterbury University in Christchurch. The topic of my research is “Modelling stem properties for eucalypts in New Zealand's dryland environments”. I am happy to be a small part of this big project and to work in this professional forestry environment, surrounded by people full of the passion, determination and vision to build the modern forestry sector. 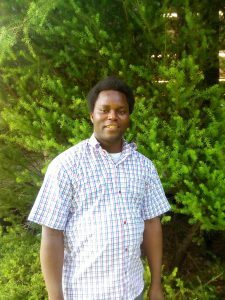 I am Ebenezer Iyiola, a graduate of the Federal University of Technology Akure (FUTA), Nigeria, with a Bachelor degree in Forestry and Wood Technology in 2014. I completed my Masters Degree in Wood Science and Product Technology in 2017 at the same university. 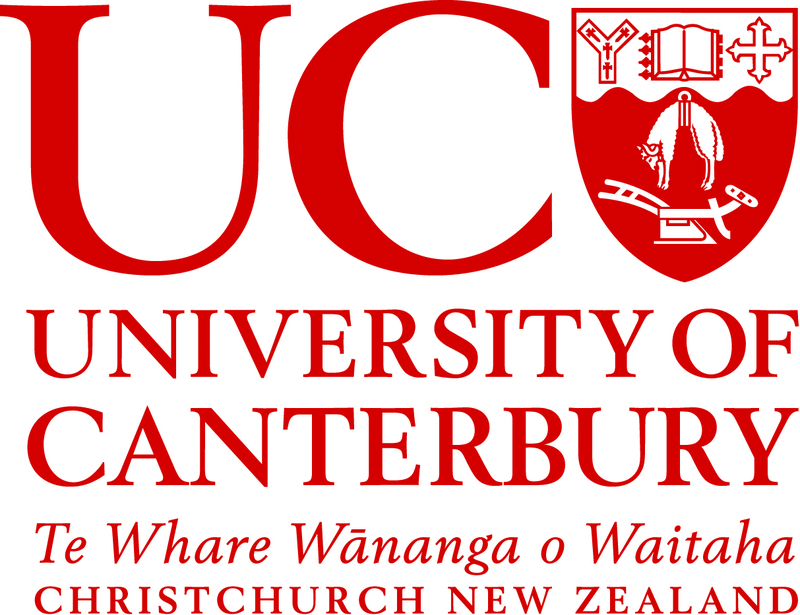 I enrolled for my PhD programme on June 1st 2018 at the School of Forestry of the University of Canterbury, New Zealand. The topic of my PhD research is ‘Wood Quality of Durable Eucalypts’. I chose to study at the University of Canterbury to broaden my experience in wood science, and because of the specialisation offered by the Wood Technology Centre. I believe that PhD research in wood science perfectly suits my profile and will enhance my career prospects. All my previous research experience, internships and community service have revolved around this area. Being a student in the School of Forestry will boost my career development and will also help me reach my potential. I would like to acknowledge all the NZDFI staff for their support during the first few months of my PhD programme. 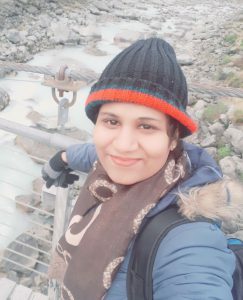 I am Chamira Rajapaksha, from Sri Lanka, and I started my PhD at School of Forestry, UC in March 2018. My current position is a lecturer of Plant Cultivation and Phytochemistry & Natural Products, Department of Pharmaceuticals, Gampaha Wickramarachchi Ayurveda Institute (GWAI), University of Kelaniya, Sri Lanka. I was offered a scholarship from the University Grants Commission, Sri Lanka with 3 years study leave to carry out my PhD at the University of Canterbury. Since I completed my bachelor’s degree, my dream has been to do my PhD in New Zealand, because the lifestyle and quality of living is amongst the best in the world. Forget the stressful noises and big city rush in the country’s second biggest city, Christchurch! The working title of my PhD is ‘Essential oils of Eucalyptus bosistoana’. I am interested in this area as I have a broad knowledge of natural compounds and the analytical techniques of extraction and identification of these compounds. Essential oils are natural volatile compounds of foliage parts of the plant. Although there are many biological activities and commercial applications in eucalyptus, only a handful studies have been done for E. bosistoana essential oil. This study could be important to NZDFI in two ways. NZDFI has already started breeding genetically superior durable E. bosistoana. Eucalyptus essential oils have high commercial demand in global markets. Therefore, it will be worth researching the financial viability of using waste foliage of E. bosistoana timber plantations. Also, E. bosistoana suffer from pest attacks, and the influence of essential oils on pest activity will be assessed, helping to identify pest tolerant families/trees for breeding programmes. My name is Seol-Jong Kim, and I am from South Korea. I studied Plant Bioscience during my bachelors at Pusan National University in my home country, and Plant and Forest Biotechnology during Masters degree at Umeå University in Sweden. My current PhD research project at the University of Canterbury is a genomic and taxonomic study of Eucalyptus species using SNP data to inform future genomic selection in breeding programmes. Additionally, I am interested using genetic markers to determine the differences between E. argophloia and E. bosistoana as we have found some families of E. bosistoana in NZDFI breeding trials to have very similar morphologic characteristics to E. argophloia while other families are very different. I am very happy that these topics are so fascinating and living in beautiful Christchurch is fantastic! 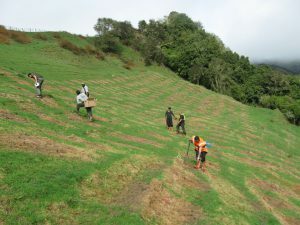 In September 2018, the NZDFI submitted an application to MPI’s Primary Growth Fund. The launch of the One Billion Trees initiative resulted in our application being diverted to this fund. application aims to secure and accelerate the work of the NZDFI over the next decade. Compiling it was an extremely valuable exercise in itself, as it forced us to get to grips with what we hope to achieve, and the operations involved, looking well into the future. We are currently working on some initial feedback from MPI. In the meantime, thanks are due to all those who contributed to the application, which required many hours work. The financial support promised by four east coast regional councils - namely Marlborough, Greater Wellington, Hawke's Bay and Gisborne/East Coast, is also much appreciated. The NZDFI recently starred in Episode 6 of the Face TV show Forest Call. 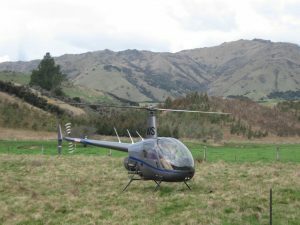 Follow the link to see coverage, including helicopter footage, from one of our breeding trials on David Dillon’s cold, dry site up the Waihope Valley in Marlborough. The propagation work going on at Proseed also features. The NZDFI slot runs between minutes 8-18 of the programme. 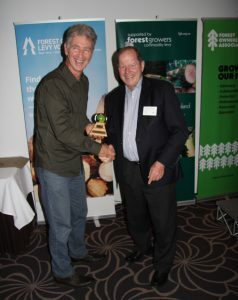 Paul Millen receives his award from Geoff Thompson, chair of the Forest Growers Levy Trust. Paul Millen, Project Manager, NZ Dryland Forest Initiative won the 2018 Forest Growers Research Award for Communication and Sector Engagement at the Forest Growers Research Conference inTauranga. The awards have been made each year since 2011 to recognise outstanding achievements in forest growing research. My award at the annual Forest Growers Research conference in October was only possible thanks to the positive interest and support given to the NZDFI by many people in the forest industry. Also many people have been willing to engage in our research and to collaborate with us to plant our trials including the eight new trials that we established last year. 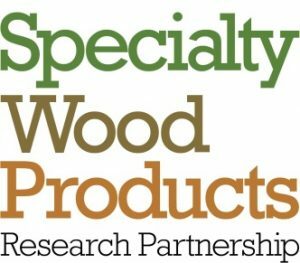 As 2018 drew to a close I had a busy two weeks in December as I participated in the mid term MBIE review of the Specialty Wood Products programme. Our meeting with MBIE’s mid term review panel went well and their initial feedback was positive. Then the following week and at the invitation of Dr Warren Parker, I was able to brief the Forestry Ministerial Advisory Committee. Dr Parker is the Chairman of this committee and I appreciate his interest and that of the Committee’s in NZDFI’s programme. Finally, the One Billion Trees initiative is a huge opportunity for us, and I’m really excited about what develops for the NZ Dryland Forests Initiative in 2019. Want to receive future Project Updates? If you do not already receive our regular Project Updates, you can sign up here.